The prototype vehicles for the Automated Guideway Transit (AGT) project of the DOST through its PCIEERD and MIRDC were delivered last Sunday, November 25, at the test track site in UP Diliman. The two vehicles will form the train that will be mounted on the test tracks and subject to experiments to test the performance and functionality. Researchers from UP Diliman, including faculty members from its College of Engineering and College of Science, will be cooperating with the DOST to provide advise on issues that are certain to crop up once the tests are underway. Contrary to many reports coming out that it will be an “upgrade” or “replacement” for the Ikot and Toki jeepneys currently operating inside the campus, the truth is that a Phase 2 creating a loop around the campus is not viable for the foreseeable future. For one, the system will be too expensive to build, operate and maintain for a very limited ridership that is attributed to UP Diliman, even with the increasing numbers of through trips using UP public transportation. Of course, it would be nice to have a system like this in campus but the costs cannot be covered by revenues from fares. Funds for construction (investment costs), seen from one perspective, may be of better use elsewhere where resources are in dire need to support other very important endeavors. A full system would be appropriate elsewhere and with funding coming not from the DOST or UP budgets but from airports, developers, local governments and others who can be the proponents for such systems. AGT vehicle delivered at the test site in UP Diliman – the streamlined body was designed by DOST project staff. The skirt helps to hide the bogey, which includes the mechanism for the vehicle to pick up power from rails embedded along the guideway. Inside the vehicle – there are few seats behind the driver’s cab to maximize space for (standing) passengers. This layout is very much similar to other AGTs and monorails including those serving airports where users would also have luggage with them. Driver’s cab – although the intention is for the vehicle to be ultimately driverless, tests will initially be conducted with a driver. Back seats – there are a few more seats at the back but the layout maximizes the number of standing passengers. Another look at the AGT vehicle – the DOST logo is prominent in the front and one side of the vehicle. The UP logo is on the other side of the vehicle. Test tracks – the AGT guideway is elevated and stretches to almost 500 meters. For reference, the photo was taken from near the project office/power house with the CHED building along C.P. Garcia Ave visible downstream of the elevated guideway. The line of trees on the right is along the University Avenue. While it is understandable that certain rail aficionados have become excited about the prospects of having an operational, functional AGT or monorail, the UP-AGT is really an experimental system. It is best considered as a “proof of concept” project that will hopefully encourage the development and promotion of public transport in many of our cities that seem to be mired in having unsustainable transport modes. But of course, any transit system such as this will not survive if no rationalization in transport services are implemented and this is particularly true if an AGT or monorail would have to compete directly with buses, jeepneys or tricycles. 1) Wind – the direction and magnitude of the wind is critical for aircraft as headwinds help generate the lift required for taking-off and cushioning landings. Headwinds will tend to shorten runway length requirements due to this assistance with lift while tailwinds will tend to increase runway length requirements. Cross winds are undesirable as they may cause aircraft to roll or stall. A useful tool for establishing wind behavior (e.g., directions and speeds) is a wind rose, which requires many years of data on wind speeds along different directions to establish the best orientation for a runway. The wind rose pretty much looks like a spider graph overlaid unto a compass, illustrating along which directions the winds are strongest. Wind roses may also be constructed according to the times of the year to account for seasonality in the information. 2) Neighboring airports and airways – one can just imagine the nightmarish situations faced daily by air traffic controllers in New York where there are several major airports not just in that city but in nearby metropolitan areas as well such as New Jersey, Philadelphia and Washington, D.C. where hundreds of flights converge in what is very limited airspace. Thus, air traffic controllers would have to be mindful of the shared air space among planes operating out of the different airports in providing guidance to pilots taking off or maneuvering for a landing. 3) Obstructions – these refer to possible obstructions around the airport and particularly along the flight paths of aircraft and imaginary surfaces are drawn with respect to the proposed runway configuration to determine the height restrictions for structures and other features around the airport. These imaginary surfaces include the projection of aircraft approaches from either end of a runway (or runways) that logically should be free from any obstructions. Cities are required to strictly enforce land use regulations around an airport to ensure safety. 4) Topography – the presence of mountains or bodies of water will influence how an airport will be laid out including considerations for future development or expansion. In many cases, mountains will influence other factors such as wind and obstructions. In certain areas, airports are built over plateaus, thereby restricting development options from the start. Examples of these in the Philippines are Baguio’s and Cagayan De Oro’s airports that are also affected by fog, adding to the challenges (and hazards) faced by pilots. 5) Restricted areas – there are certain “no fly” zones in cities such as the airspace directly above sensitive areas or buildings like military camps or the official residences of heads of state/government (e.g., Malacanang, the White House, etc.) are enforced as a matter of security. 6) Bird hazards – there have been an increasing incidence of bird strikes reported in the local news with many attributed to the increase in numbers of migratory birds. These pose hazards to aircraft (even the large jetliners) as the birds can get sucked by their engines resulting to damage to the propellers or fan jets. As such, many airports employ staff to ward off birds or use devices to disperse them. These efforts, however, are limited to the airport grounds. Beyond the airport, birds, particularly those in protected areas may still pose dangers to aircraft should the areas be along the aircraft flight paths. 7) Control tower visibility – air traffic control provides guidance for aircraft operations whether they be on the ground or in the air. While there are modern, hi-tech instruments available in most large or major airports, safety and guidance is greatly enhanced with the tower visibility to pilots (and vice versa). 8) Jet blast and wing tip vortices – aircraft take-offs and landings are regulated not just in terms of who has priority over the other (e.g., landing aircraft typically have the “right of way” over those waiting to take off) but also to give some headway in order to allow for the dissipation of turbulence generated by aircraft operations. This may be especially important in cases where there are multiple runways including intersecting configurations where aircraft may cross flight paths. 9) Runway length – the required length of runway may be dependent on the types or models of aircraft that intend to use it. Larger aircraft will require longer runways with the Boeing 747s requiring about 2 kilometers for take-offs under various conditions. Smaller aircraft, of course, will require shorter runways and typical airstrips for 2-seater or 4-seater aircraft can be less than a kilometer long. 10) Environmental factors – aircraft operations inevitably lead to pollution including the emissions and noise they generate. As such, land uses around airports should be planned accordingly in order to reduce issues pertaining to noise and air quality. Unfortunately, land use regulation in Philippine cities are not strictly enforced and so there will always be developments that are incompatible with airports with ironies when communities developed after the airport complain of noise and air pollution. Passing along East Avenue in Quezon City one morning, I couldn’t help but notice the pedicabs (non-motorized 3-wheelers) lined up near the junction from Agham Road in what is just one of the so many informal transport terminals in this city. The motorized tricycle in the photo below is just a bonus but also notable as they weren’t supposed to be running along national roads like East Avenue. They are well within the sight of the Land Transportation Office (LTO) and the Land Transportation Franchising and Regulatory Board (LTFRB) – two agencies charged with vehicle regulation though these 3-wheeled public transport modes are technically not under the LTFRB and LTO has no jurisdiction over NMTs. I suppose that the local government is well aware of their existence as their operations are legitimized through local regulations. The proliferation of these modes and particularly the non-motorized 3-wheelers are due to the toleration if not encouragement from the local government. These are examples of “accommodations” and tolerance due to these being a source of livelihood for many informal settlers who typically operate these vehicles. In the case of the scene in the photo above, there is the proliferation (and over-supply) of these 3-wheelers whose drivers and operators make a living out of people not willing to walk because of poor facilities or perhaps out of sheer “katamaran.” In many cases, operators and drivers are residents of informal settlements such as those along Agham Road. God forbid that some of these are unlawful people who take advantage of passengers including unsuspecting or absent-minded students and office workers. Are these forms of transport suitable for this setting? Are they safe forms of transport? Shouldn’t there be a drive to have better pedestrian facilities and more “formal” transport services for a city’s constituents? These are persistent questions that theoretically have answers in terms of good practices found elsewhere. However, in many Philippine cases solutions are dependent on how progressive and serious LGUs are with dealing with these issues. Success is dependent on the initiatives of the LGUs who are in the front lines when addressing concerns on local public transport. We chanced upon the fellow shown driving an electric vehicle below with what was apparently his wheelchair mounted behind the vehicle. And then I remembered seeing other people in wheelchairs traveling along the traffic lanes of similar streets, and exposed to the high risks of being sideswiped or bumped by motor vehicles. These and other persons with disabilities (PWDs) are among what we usually categorize as transportation poor or those who are marginalized when traveling. Marginalization comes in many forms including the lack of or inadequate infrastructure and facilities for PWDs. Sidewalks are usually narrow, making it difficult even for able people to use, and definitely inaccessible to persons needing the space to move about. I remember that Tahanang Walang Hagdanan (translated Home without stairs or steps) is located in Cainta, Rizal. 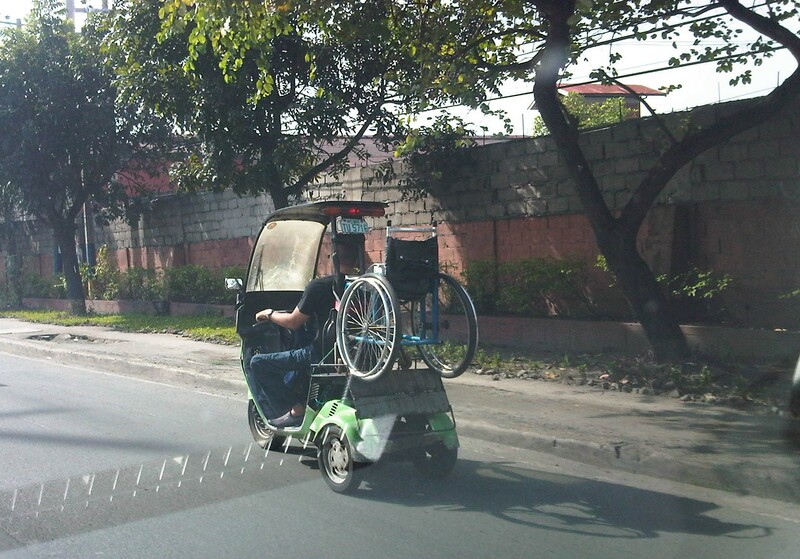 We used to see PWDs on their wheelchairs traveling along Bonifacio Avenue in the poblacion to go to church on Sundays. Often, jeepneys, buses and cars come very close to them that you might wince at the near misses of what could easily be a tragedy just waiting to happen given the odd mix of people on wheelchairs mixed with motorized traffic along the carriageway. The local government should have exerted more efforts to put up facilities adequate for the needs of pedestrians in general and PWDs in particular; the latter considering the significant number of constituents requiring such facilities. On a map, you can even see that Tahanang Walang Hagdanan is just beside the Cainta Local Government Complex. I believe the provision of basic facilities to enhance the safety and mobility of PWDs is just one example of what a city or town should be doing towards realizing inclusive transport or inclusive mobility at their level. It would definitely go far in promoting people friendly, sustainable transport for all. An article came out of Rappler last weekend referring to addressing one of the most persistent problems in Metro Manila – traffic. It is a problem that is the result of years of neglect, poor planning, inconsistencies and a lack of foresight for future transport needs. I don’t usually write replies or comments on material posted online. I believe it is a very public platform and nowadays, when there’s a lot of talk on items like plagiarism, transparency, freedom of information, etc., it seems so easy to solicit opinions and comments from anyone who would care or dare post one. And transport and traffic seems to be a topic where everyone has his/her own opinion so much so that some people tend to project themselves as experts on the topic. Nevertheless, I thought that an opinion was necessary in order to offer another perspective on the matter of the “beast.” I would like to believe that in our case, we probably have had one too many “thought leaders” in transport and traffic. It is time that we also have “action leaders” who would do rather than simply say or write. We need people who will practice what they preach and actively and willingly contribute when called upon for help in solving this traffic mess we are in.